In 'Step 4: KPIs', you can select and/or create the key performance indicators (KPIs) which are important for your business, or your client's business. These KPIs help to track both financial and non-financial performance. The KPIs selected here will appear in your reports and analysis tools (more specifically in the 'KPIs' and 'KPI Explorer' analysis tools, and the 'KPI Results' and 'KPI Explorer' report components). You can choose a maximum of 60 active KPIs. However, depending on your business size and type, you may wish to select a fewer number (i.e. 5 to 15). A green tick indicates that a KPI has been selected. KPIs can then be grouped in categories. When selecting your KPIs, you can assign a degree of importance to each KPI. Click on the appropriate star to assign low, medium, high or critical importance. The important level helps to organise and prioritise your active KPIs. You can also arrange and re-order the KPIs presented in your reports. Simply drag & drop KPIs or categories to re-order. This will effect the presentation order in your reports and analysis. Fathom calculates 50+ standard financial KPIs by default. In addition, you can create your own custom financial and non-financial KPIs. Non-financial KPIs can be used to measure operational data, leading indicators, or common business measures, for example: sales & marketing, customer service, production, operations, research & development, human resources etc... Results for these KPIs must be imported into Fathom from Excel (see importing instructions) or manually entered into Fathom, in 'Step 1' of the company setup. Account Watch KPIs enable you to track any account from your general ledger as a key metric in Fathom, allowing you to keep a close eye on key Income or Expense accounts. Performance can then be tracked against budget. 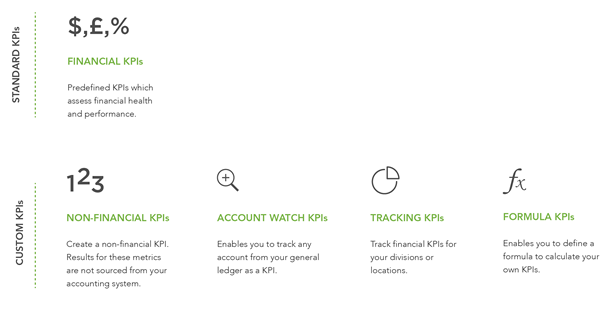 Tracking KPIs enable you to track financial KPIs for your divisions or locations. 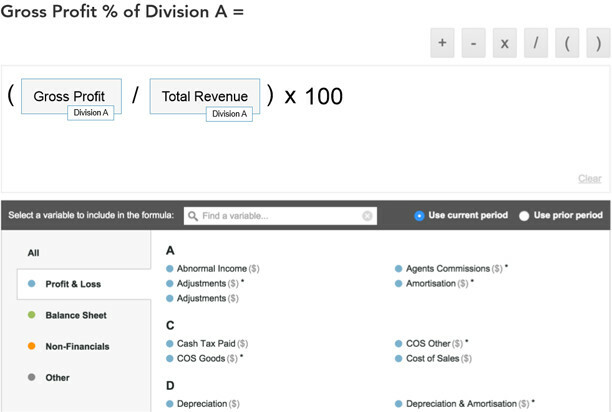 Formula KPIs are created by defining a formula for calculation. For example, you can create a KPI to track any expense accounts as a percentage of total costs or total revenue. You can also create KPIs using both financial and non-financial data (eg. ‘Revenue per Employee’). In addition to creating a new KPI, you can also select a KPI which you have previously created and stored in your KPI Library. To access your organisation's KPI Library select 'KPI Library' from the top menu. Specify a name, description, unit of measure, aggregation type, category and target type. Summative: Sums the KPIs monthly results into a total for the Quarter or Year. KPIs related to items on the Profit and Loss (Income Statement) would typically use a Summative aggregation type. Balance: Shows the balance of the result for the ending month in the Quarter or Year. KPIs derived from Balance Sheet items, or non-financial KPIs such as 'number of employees' would typically use a Balance agreggation type. Average: Displays the average of the Monthly KPIs results over the Quarter or Year. KPIs measured as a ratio or percentage would typically be averaged over the months in a quarter or year. Decimal places: This represents the precision to which the KPI is measured (zero, one or two decimal places). Your selection of KPIs and their importance can be updated or changed at any time in the future. 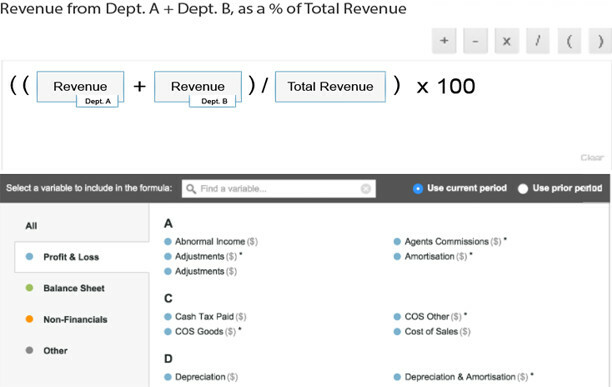 For formula KPIs, you can define the calculation using the formula builder. 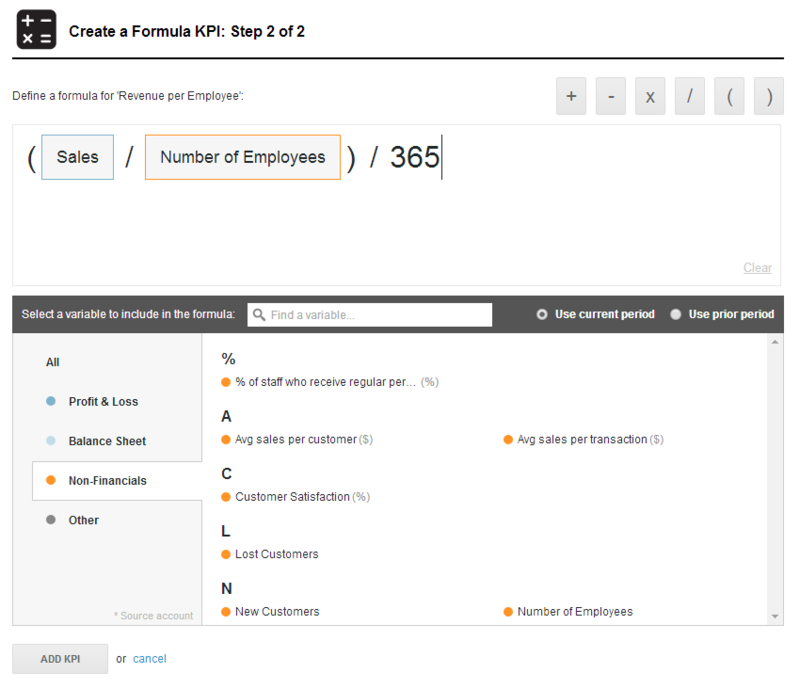 You can select from a range of different variables when building a Formula KPI. This includes: Accounts from your source accounting system, Custom headings/groupings created in your Fathom Chart of Accounts, Non-financial KPIs, Summary financial items i.e. 'Gross Profit' and 'EBITDA', and Default rates (specified in Step 2 of setup). You can return to this step at any time to change your selection of KPIs. You can create custom KPIs to track the performance of your divisions, departments or regions. 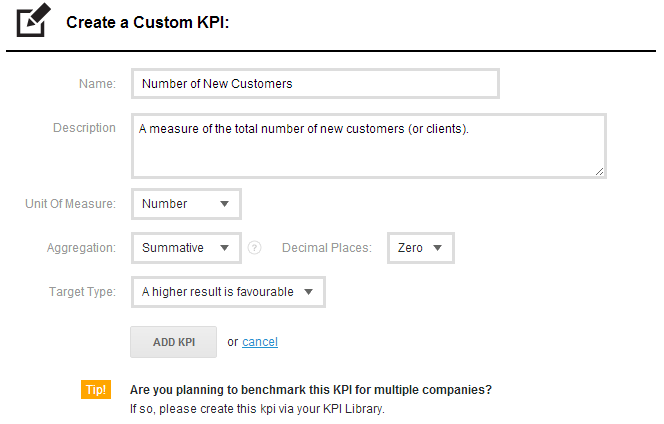 Click ‘Create a KPI‘ > 'Formula KPI' to get started. Then using the KPI formula builder, you create your own custom KPIs, for an individual division, department, location, business unit etc. You can also create your own custom KPIs, which track the performance of multiple divisions, departments, locations, etc. When this step is complete, please proceed to ‘Step 5'.